Too bad, I really like the look of the above plate! Somebody beat me to it! How about this one? It is another way of saying Puteri's. Since I can't put a heart in the front or the back, Doug suggested I put the number 1. What do you think? I replaced the letter "I" with the number "1". Looks close to the real thing. I quite like it. How about this one? Put the number 3 instead of the letter E. What do you think? I can't think of any better combination. 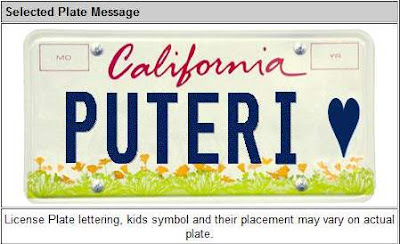 Since I can't get what I want the next best thing is when someone looks at the alternative plate, somebody automatically sees PUTERI. Does any of the above do that? You like No. 3? Hmm .. must buy more cars like that oi, so can put PUTERI 2, PUTERI 3! Hahah. Forgot how much it cost already. I think initially $70 + $ 90, and then just $90 annually. How 'bout this? 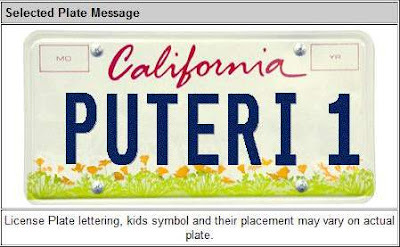 Get the plate "PUTERI S", then we paint a little ' to make it "PUTERI'S". I don't think the cops will mind an apostrophe! 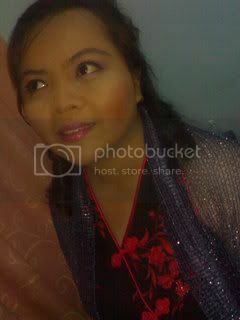 Aku rasa semua nyak cantik :) hehe..
To start off with, you have such a beautiful name. So regal. I don't mind PUTER1 or PUT3RI. Should be fine. 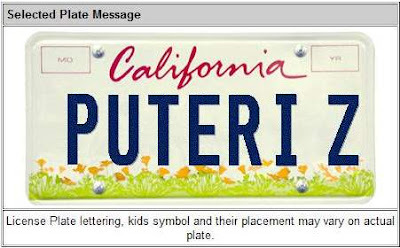 By the way, My daughter's name also starts with Puteri. Ladybird, I like PUT3RI too. :-) See which one gets the most votes! Pat, you are not helping, semua cantik eh! Pilih satu lah. Yes, Puteri is a regal name. That is why I chose it! Heheh, angan angan nak jadi Puteri! Maybe I should legally change my name? Hehe, easy to do here! I agree with you Ruby, either PUTER1 OR PUT3RI looks fine to me too. PUT3RI seems to be the popular choice so far. What a pretty name for your daughter. Mine, I pilih sendiri, my online persona/alter ego! Hah! Amy, three enda sama bunyi enggau tree. Enggai nyadi, enti di M'sia ok, laban mayoh org enda nemu nyebut three enggau betul! Hehe! Pat, seems like PUTER1 is as popular as PUT3RI! Susah ka milih, eh! banyak terror la...I already pusing pusing looking for the one you suggested..so far today,your blog is easy to access or maybe my computer come back from going akput!! hahaha!! Ya, I have a few blogs, back up you know, if one loses its PR at least got 1 or 2 new ones that will have some rank! For now I am keeping two completely off paid posts. Three others are not suitable for paid posts so I don't even bother .. I don't update those that often either. Anyway, hope your pc won't hang anymore when you visit any of my blogs. Hi, what about " 1 Puteri " ? Ian, you know what the more I think about it the more I like the sound of 1 PUTERI!! There's only one Puteri,right? Heheh. I do indeed like it, Ian!! I think I might choose this sequence!